Do you own or run a high quality educational website for elementary & middle school kids? Experiland’s award-winning, family-friendly educational products have been a trusted favorite with kids, their parents & educators since 2010. Our science project e-books are specifically aimed at elementary & middle school kids (Grades 1-8). We are always looking to build new strategic partnerships that will offer more value to our website’s users & customers. If you own a educational website or product that are similar to ours, why not partner up with us & get your product listed here? Maze Mind – Can you escape? Maze Mind is the ultimate 2D escape the maze puzzle game on Android! This exciting maze game contains various classic ‘escape in time’ mazes with varying difficulty. There are also several adventure maze game sets with exciting twists and surprises to keep you entertained for many hours! 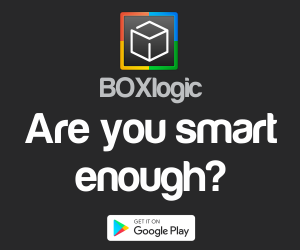 BOXlogic is a fun but hard logic puzzle game. The concept is simple, but this puzzle game will require you to constantly think outside the box and apply your brilliant mind to get the levels solved. The game starts off with some relatively easy levels, but there are a lot of extremely difficult puzzles to solve that will keep you thinking for many hours! If you love pushing your brain and are not intimidated by a challenging logic puzzles, this one is for you! Think Numbers is a hard riddle game about recognizing the role a specific number play in general life. The game contains 100 levels with each level a riddle corresponding to the level number. Can you spot the significance of each number from 1 to 100 in this ultimate brain busting quiz? Please contact us if you have a great educational product that you want listed here.